is a blended Scotch whisky with smoked notes produced by Pernod Ricard. The company says it is the “7th largest blended Scotch worldwide”, “No. 2 standard whisky in Asia”, and the “No. 1 standard whisky” in Thailand. 100 Pipers sponsors an annual “India Music Week” festival. The 100 Pipers is a blend with 25 – 30 whiskies. Much of it comes from the Allt a’Bhainne Distillery, which is also owned by Pernod Ricard and does not have its own bottling facilities. 100 Pipers is bottled in Scotland. The blend was created by Jimmy Lang and Chivas Brothers master blender, Alan Baillie in 1965 and first launched in the US. Four years later the name ‘Seagram’s’ was added to the label (and remains to this day), and the Scottish flag removed which is a damn shame, treason! 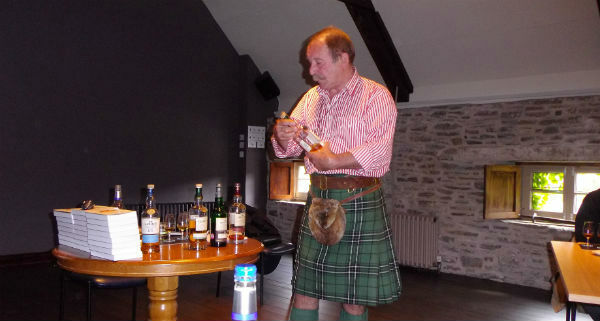 A 12-year-old was added in 1986, followed by a 20-year-old in 1988, by which point 100 Pipers was selling 800,000 cases globally, of which 270,000 were in the UK. It was claimed to be the fourth best-selling Scotch in Scotland. In 1992 it became the first Seagram-owned Scotch in Korea and launched in Thailand a year later. In the UK it was blending itseelf into ‘The Black Watch’ blend. With sales in Thailand reaching 2.7m cases, the brand peaked at 3.4m cases in 2005, becoming the 5th biggest standard Scotch globally. 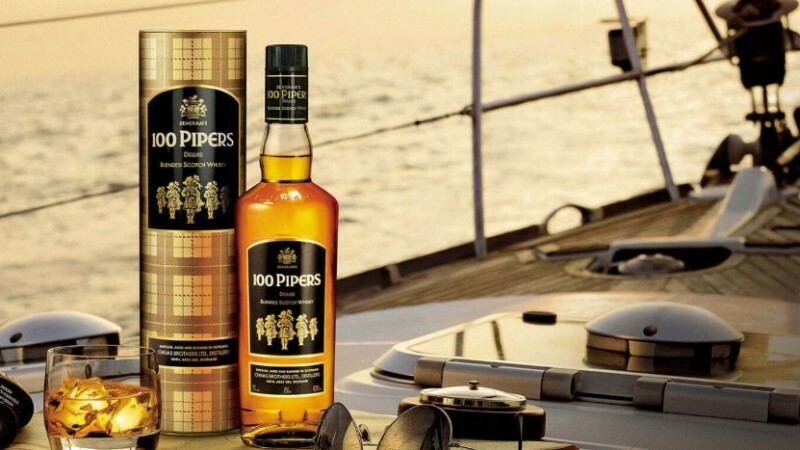 That year, a 100 Pipers 8-year-old blended malt was launched in Thailand. All this time the brand’s spiritual home was Allt-a-Bhainne (took a tour here a wee while ago whilst on tour with Ingvar Ronde), the Speyside Distillery built by Seagram in 1975. It is also locally bottled in India where sales of 100 Pipers reached 300,000 cases in 2011. The brand owes its’ name and Celtic imagery to the Scottish tradition of bagpipers leading soldiers into battle. The “100 Pipers” name in particular comes from the ballad of “The Hundred Pipers” (a long ditty written in the Scots), which tells of the story of Bonnie Prince Charlie’s 1745 Jacobite uprising led by 100 bagpipers. Wi’ a hundred pipers, an’ a’, an’ a’.